Is the New Kindle With Special Offers Really Cheaper? You are here: Home / Frugal Living / Is the New Kindle With Special Offers Really Cheaper? 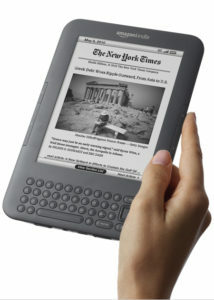 Amazon.com just released a new version of the Kindle that sells for just $114. The catch? The new “Kindle with Special Offers ” is the same e-book reader you’ve seen, just $25 less and with advertising. The advertising, or “special offers” and sponsored screensavers display on the Kindle screensaver and on the bottom of the home screen. Amazon claims they do not interrupt your reading. Their goal is to get the Kindle into the hands of as many readers as they can. And they’re going to make a pretty penny doing it. At first glance, the $114 price seems like a great deal. But think about this: You are allowing Amazon and whatever affiliates they are working with (their site mentions Buick, Chase, Olay and Visa) to market their products and services to you for as long as you own your kindle. Is the $25 in savings worth an endless stream of advertisements and sponsored screensavers for the next several years? And how many of those advertisements and special offers will entice you to spend additional money? Maybe it won’t be much of a savings after all. I’m not sure I’d settle for being subjected to unlimited advertising for a mere $25. And with the rumor out there that the Kindle will come free with an Amazon Prime membership this fall, I’m not sure I’d rush to buy one just yet. You don’t need a Kindle to read Kindle books anyway. Note: This post contains affiliate links that help support this blog at no additional cost to you. Please read my disclosure policy for more details.